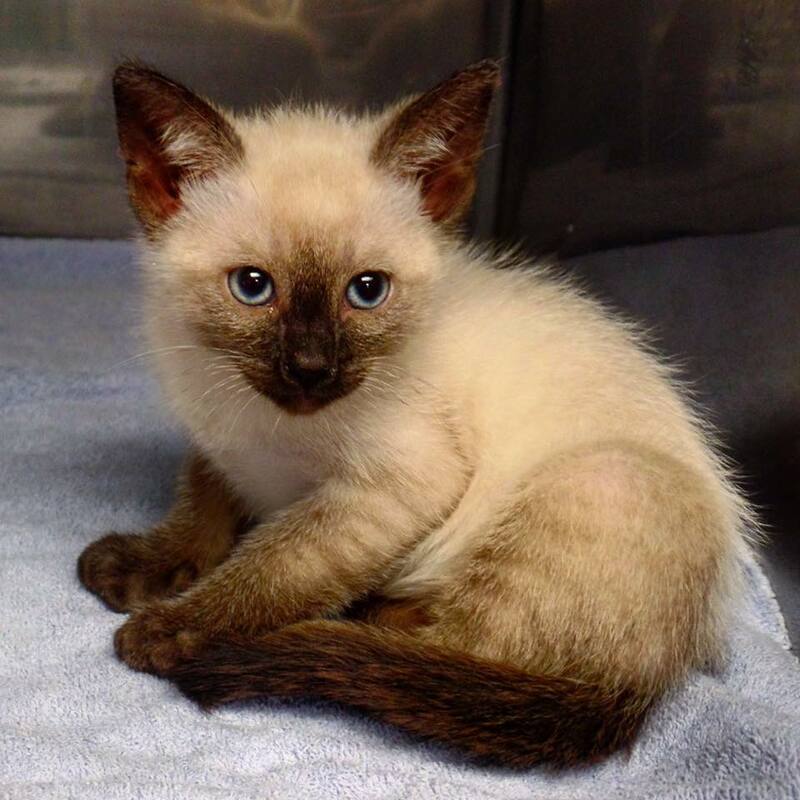 Miracle is an 8 week old kitten that was brought to us by a very caring and concerned owner; Miracle had sustained a broken femur, and the owner was very worried that the fracture was so bad that the only option would be to amputate Miracle's leg. 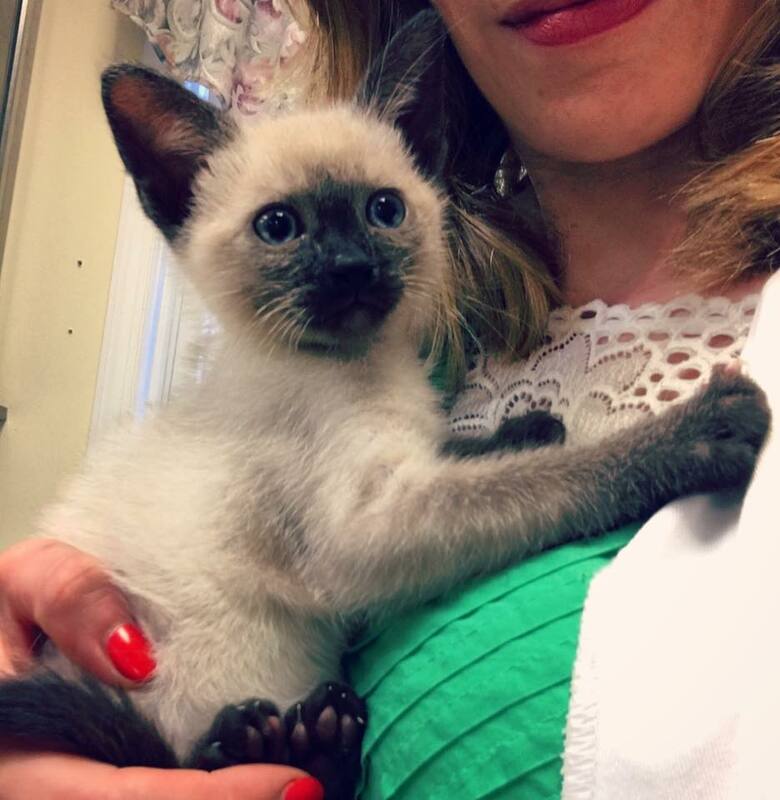 While animals adapt very well to having only three legs, amputation is still considered a last resort procedure, so we wanted to do our best to avoid that if possible, especially for a kitten just starting its life. 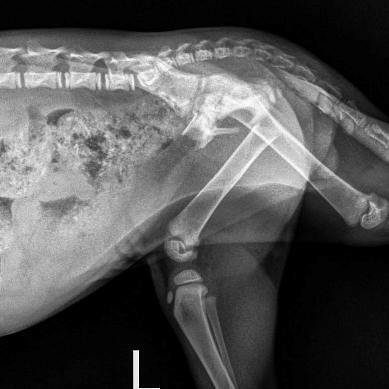 After surveying the x-rays, we could see that Miracle had definitely sustained a left femoral fracture; the distal piece was quite long, but the second fracture piece was really only the head of the femur and would be a difficult fracture repair to make due to the small size of the proximal piece. 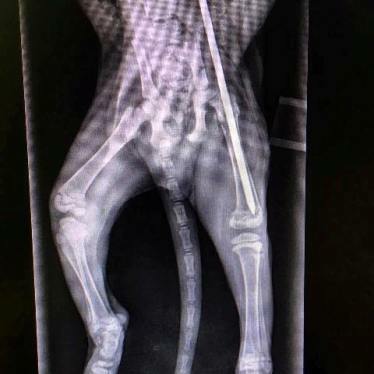 However, Dr. Scott Gounaris felt confident that we could save this little kitten's leg by placing a steel pin through the fracture pieces to reunite the bone. This device is called an intramedullary pin, or IM pin. Miracle is lucky he is so small, as an IM pin can rarely be used as a fixation device alone due to forces on the bone. In most fracture repair cases, bone plates must be used in conjunction with either IM pins or other devices, such as cerclage, wires in order to adequately repair and stabilize the bone and ensure that it can withstand the many forces that are place upon a bone when an animal uses it. 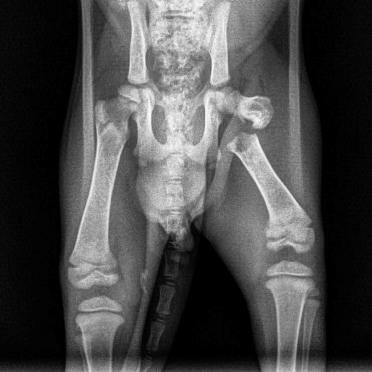 However, in a kitten weighing only 1.8 pounds, an IM pin can be used without having to place extra bone plates or other fixation devices. IM pins must also always be chosen carefully, as one with too large of a diameter can cause the bone to split into even more pieces. The surgery was a little challenging, as the proximal end of the fracture was very short and difficult to find. 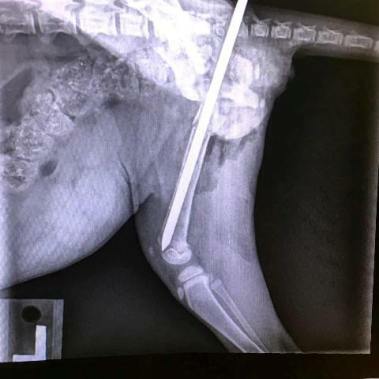 However, with a little perseverance, Dr. Scott and Dr. Becca were able to reunite the two pieces with the IM pin, as shown in the post-operative x-rays. We did back the pin out just a tiny bit as to not interfere with Miracle's growth plates, and are very happy with how this surgery turned out!! Bone is incredibly good at healing, and will quickly remodel itself to reunite the two fracture pieces into one bone once again. Miracle is reportedly doing very well at home! He needs to be cage tested for several weeks, and his owner says this has been a bit of a challenge since he is back to feeling very spunky and playful. When he returned for his suture removal, he was bearing weight very well on his left leg; he still needs to be cage rested for a little while longer, but per the owners, Miracle is as good as new. We are very thankful to have been entrusted with such a delicate case, and are thrilled that we were able to save Miracle's leg! !